Nobody wants to send or receive spam. Unfortunately spam-blockers, especially the Gmail blocker, over-reach and block legitimate messages the recipient wants to receive. This post provides detailed steps that B2B digital marketers can take to shield marketing email messages from spam blockers. It zeroes in on avoiding blockage by Gmail and Google Suite and discusses Google Postmaster. 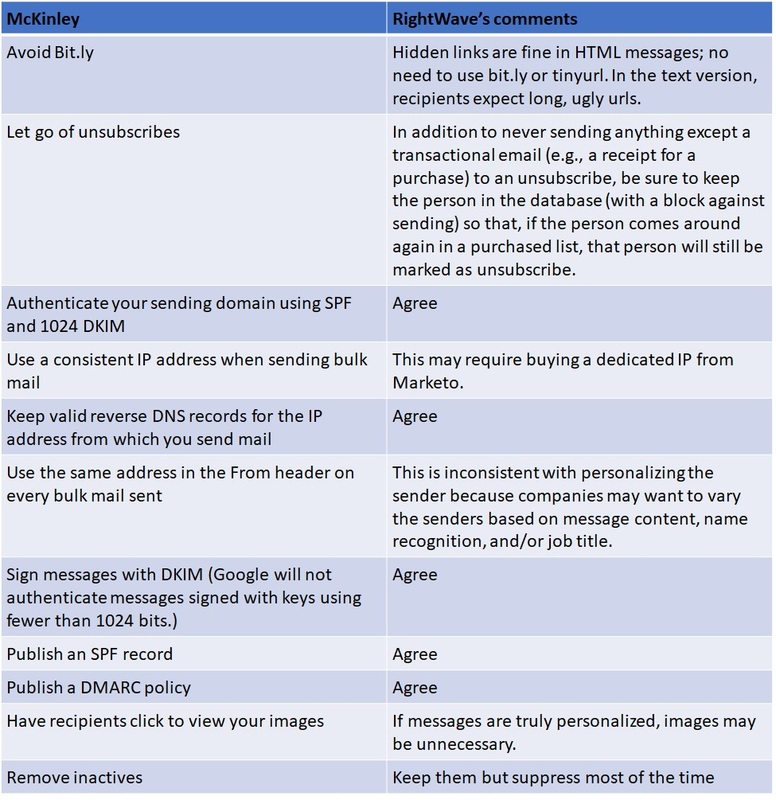 Advice from three expert sources (1) (2) (3) includes these steps to sharply reduce spam detector blockages and other reasons for email not reaching the inbox. Half of all Marketo’s billions of email messages go to Gmail, half to personal Gmail and half to Google Suite (2). Gmail does not report on messages on which the recipient clicked Spam (2). RightWave strongly encourages the use of Google Postmaster and is willing and able to assist. Contact RightWave for more information. Email marketing remains the most cost-effective tool for B2B marketing (10). That effectiveness is increased by ensuring that most messages are delivered. Unfortunately many spam detectors block legitimate messages that the addressees want to receive. Understanding how spam detector algorithms work and taking steps to avoid them is well worth the effort.